The 2018 FIFA World Cup soccer championship has drawn millions of sports enthusiasts to Russia. Preparations for this athletic mega event have been at full throttle for a long time. With 32 countries facing off in 64 soccer matches, everything must be perfectly coordinated so as not to mar the magic of the event. This requires a committed approach to work and plenty of resources. If supply chain is the ultimate team sport, the world championship in Russia and other large events are mega-examples of how logistics teams up and down the supply chain must all play a role and work efficiently to deliver the goal. Connectivity and collaboration is key. Here are four aspects participants must address in their game plan. Many of the deliveries to Russia span thousands of kilometers from origin to destination. To ensure efficient processes, make the best use of warehouse space, and ensure short delivery times over long transport distances, shippers and forwarders generally rely on the most cost-efficient transport mode and/or route. As effective as this concept is, it also brings challenges. If goods get lost or delayed, the whole supply chain can be affected. Even though more processes are being digitized, many companies still enter movements manually into an Excel sheet — making real-time visibility impossible, not to mention that the process is very time-consuming. However, with cloud-based TMS technology, shippers and forwarders can optimize processes, consolidate delivery information, and minimize the risk that goods will be lost on the long trip to Russia. Beyond that, positive customer experience is a major key to business success. On important orders, early deliveries contribute to a company’s good reputation and help attract further business. As part of a collaborative network, shippers, forwarders, and carriers also benefit from lower costs, greater efficiency, and better communication and visibility. Companies must ensure that they have enough flexibility to react to unplanned disruptions if and when they occur. Moving goods to an event on the largest stage of its kind is not the time for amateur hour. Even customers of small and mid-sized service providers expect value-added services, such as in-transit realignment. Many customers expect delivery to their door in the shortest possible time, and the B2B sector is demanding more custom delivery experiences as well. An upstream control unit and visibility tool for transportation management, such as a Control Tower system, gives shippers and forwarders the needed transparency in their supply chain. This allows quick, efficient ability to redirect orders and transport changes while en route. For example, a controller can shift six surplus pallets from an overnight flight to a three-day truck route to ensure that the goods arrive later and more economically. A further hurdle in the supply chain is the complex web of customs requirements. Every country has its own regulations that affect movement of goods — especially foods, seeds, plants, and animal byproducts. Transport and logistics companies must be able to fill out customs declarations quickly and precisely so that the shipment complies with local and national law. The carriers must continually be notified of changed regulations to minimize risk, delays, and fines. A stable customs management technology system is the most effective way to ensure compliance with current customs regulations. When the processes are digitally automated, companies can manage their documents in a central hub and file electronically with the various customs authorities. Thanks to automatic workflows and customs declarations, the goods can be transported faster while decreasing the risk of error or even fines. Climate considerations are important when it comes to transporting perishable food items and other temperature-sensitive products. Fluctuating temperatures, humidity, and pests threaten the condition and quality of deliveries. It is therefore essential that shippers and forwarding companies have the tools and ability to control transport temperatures and to adjust them, if necessary, to keep the goods in top condition. For example, bananas can’t be transported by air, because they spoil in the low temperatures and the varying air humidity of the cargo area. It is therefore important to plan routes and modes of transport precisely. Using a flexible TMS system, transport can be planned or redirected to avoid extreme weather conditions. On your mark, get set, GOOO…AL! 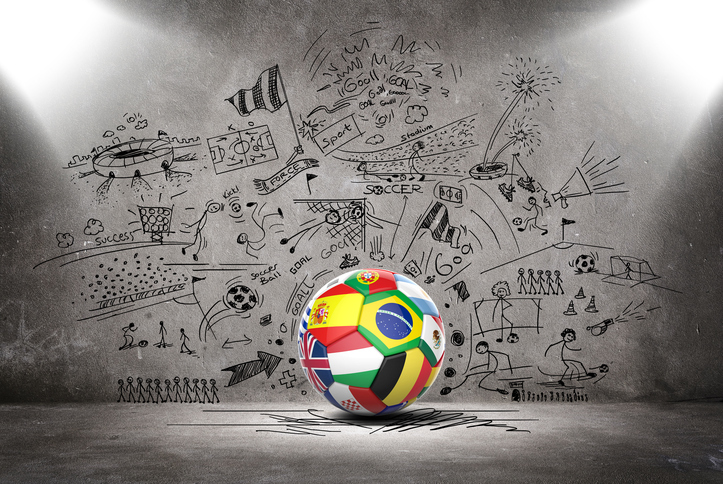 Large global events like the World Cup underscore the requirements involved in the daily work of logistics and supply chain. Companies are confronted with an ever-more challenging, multifaceted environment, and a global economy. Like a skilled athlete, companies must be flexible and well prepared to perform these tasks successfully. With an end-to-end supply chain platform and Global Trade Network, organizations get competitive advantage to deliver on their goals and win more customers.